What is Modvigil (Modafinil) used for? Modvigil contains modafinil, a potent wakefulness-promoting agent. Each modvigil tablet contains 200mg modafinil, usually enough for a single daily dose. Modafinil is approved by the FDA to improve wakefullness in people suffering from sleeping disorders such as narcolepsy, shift work sleep disorder or sleep apnea. Modafinil is also used as a nootropic drug by students and workers to improves cognition, memory and alertness. How should I use Modvigil (Modafinil)? 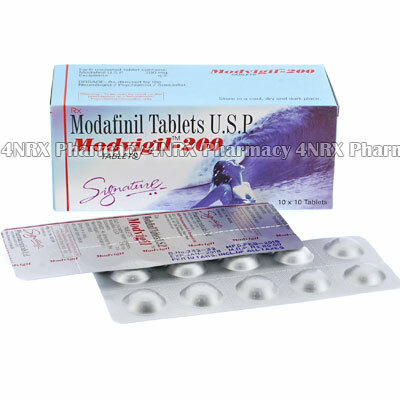 Modafinil tablets should be taken as a single 200mg dose in the morning if being uused to treat sleeping disorders. If being used as a nootropic, a single 200mg dose should be taken one hour before starting your work. These dosages are generalized. You will need to discuss your starting dosage with your doctor. What are the side effects of Modvigil (Modafinil)? The most common side effect associasted with modafinil is headache. You may also suffer from nausea, anxiety or nervousness. Back pain, muscle stiffness, belching, vomiting, diarrhea, constipation, heartburn or indigestion, decrease in appetite, dryness of the mouth or skin may also occur. If you show any signs of allergy (swelling, puffiness, difficulty breathing, rash) contact your doctor immediately. Modafinil can not be taken by everybody If you have heart or heart valve problems, modafinil can exacerbate this.